It may just touch the surface of the Buffalo Bill Center of the West’s collection of more than a half million historic photographs, but the special photograph exhibition Retrieving the Past: Favorite Photos from the Archives gave viewers a fascinating glimpse into this vast photographic record. This popular exhibition reproduced dozens of images from locals Jack Richard (1909 – 1992) and Charles Belden (1887 – 1966), along with the Buffalo Bill Online Archives collections. Together, they tell a unique story of the American West. 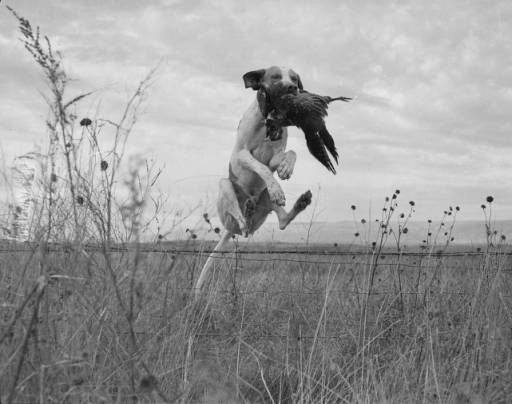 Photographers Jack Richard and Charles Belden each captured moments of energy and action in their respective genres. Richard was from Cody and worked in the area from the 1940s to the 1980s. His crisp, superbly composed images artfully document the wonders of Yellowstone National Park and capture the western way of life, including local industry, ranching, and aerial photography. 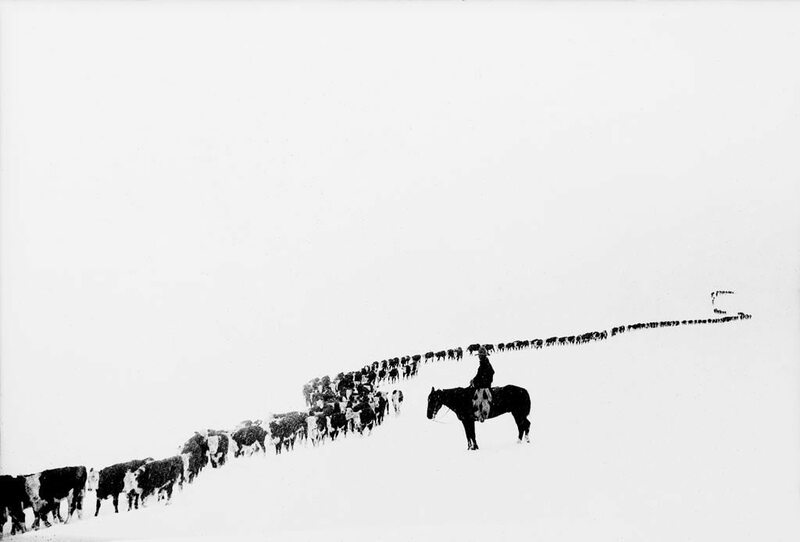 Charles Belden photographed ranching in northwest Wyoming, particularly on the Pitchfork Ranch near Meeteetse, Wyoming. There cowboys worked cattle with the Absaroka Mountains as their backdrop. 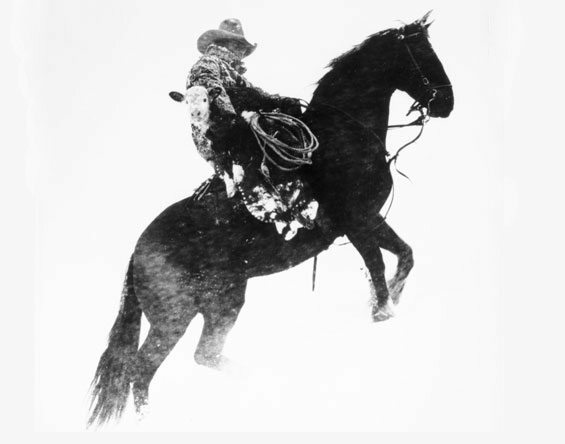 Belden’s images were taken in the 1920s and 1930s on the legendary Pitchfork Ranch at the base of the spectacular Absaroka Mountains near Meeteetse, Wyoming. By photographing cowboys and cattle against this spectacular backdrop, he created some of the classic images of the American West. The historic photographs taken from the Buffalo Bill Online Archive show the changing face of William F. “Buffalo Bill” Cody (1846 – 1917) from a young man living and working on the frontier, to Wild West entrepreneur, to aging businessman. Images in the collection range from portrait posed in studios to moments captured in everyday life and in the arena. The images in Retrieving the Past, on view through mid May 2015, are among those most requested of the Center’s McCracken Research Library—many of which are available for purchase along with thousands of other photographs from these and other collections. Through ongoing, grant-funded projects, Library staff continue to digitize these historic images to increase public use and accessibility. The online collection of the Buffalo Bill Center of the West’s vast historic photographs collection is made possible variously and in part by OCLC (Online Computer Library Center, Inc.); Mrs. Lynne Cheney; Wyoming Cultural Trust Fund, a program of the Department of State Parks and Cultural Resources; Institute of Museum and Library Services; and Carol McMurry Library Donor Advised Endowment Fund, through the Wyoming Community Foundation. To learn more about the Center’s exhibitions, visit centerofthewest.org/explore/exhibitions.